Social media is empty without high-quality content. This week’s reading list is all about content marketing. From specific content marketing tips to help you manage things from day to day to content marketing strategy that will keep you growing and improving as you go along. First an amazing slide deck about content strategy from Margot Bloomstein (@mbloomstein), Brand & Content Strategist at Appropriate, Inc.
Brand-driven content strategy complements the user-centered design. These slides will help you get up to speed on the philosophy, questions, tools, and exercises to implement it. Prioritize communication goals, develop a message architecture—ideal whether you maintain content for the Web, mobile apps, social media, or offline experiences. Discover how a brand-attributes card sort can help you identify potential pitfalls and points of disagreement while you improve organizational alignment. Then use this foundation to conduct a qualitative and quantitative content audit. What content matters most, anyhow? These questions and other challenges drive content strategy and the business issues beyond it. Next use these content marketing tips to get instant results. Omar Mohout, Growth (@omohout) Engineer at Sirris describes easy to follow steps to create content and get it noticed. The fast track to credibility is content that vouches for your expertise. With just eight hours and $135, you can create SEO-optimized content for multiple distribution channels and jumpstart your position as the go-to person in your field. Building your content takes 7 simple steps. By outsourcing key elements, you will increase the appeal and also save time. If the quality is top notch, the more content you produce, the greater your chance to cast yourself as an expert. So, in the end we do all this content marketing to get more business, sales, demand for our products and services. In this Eloqua & JESS3 (@Eloqua) slide deck you will get and overview how content drives demand. From Content to Customer takes a look at relationships between content marketing and demand generation. The presentation overlays content on top of the buyer’s journey and indicates the best practices in creation, distribution, and measurement at each step of the funnel. 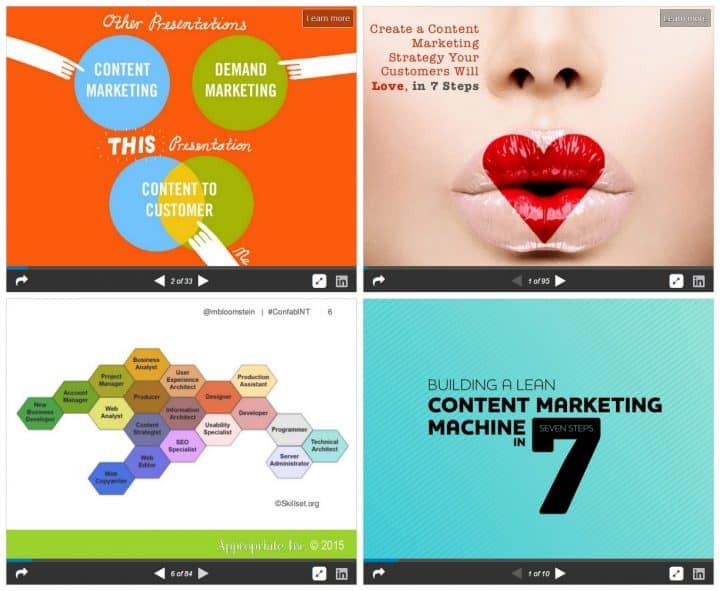 Almost one hundred slides from Jay Baer (@jaybaer) on how to create your content marketing strategy. Make sure you don’t miss this slide deck filled with stats, new ideas and actionable insight. Here’s how to create a content marketing strategy your customers will love, in 7 steps. This presentation from Jay Baer will help you craft a winning content marketing strategy for your organization. The principles in this presentation are used by Jay Baer and his Convince and Convert consulting firm on behalf of some of the largest companies in the world. Learn how corporate objectives, audiences, audience inquiries, metrics, content execution, and even social media work together to make content marketing programs successful. You’ll want to print this one out and share it with your team. These are just 4 slide deck but getting this stuff done can fill a year. So, browse through the slides take some notes and the take action!